Performance Wood Products was founded in 1994. In the time since, we have helped our customers with all aspects of their requirements for wood products in quantities of 100-100,000. Many of our customers have been with us since the beginning. In the early days of Performance Wood Products our focus was primarily on the Wood Handle business. Handles such as wooden tool handles, wooden furniture handles, wooden paint brush handles, wooden brush block handles and wooden toy handles were very much in demand by our customers. As our customers businesses expanded, so did the need for additional categories of Wood Products and Components. Dowels became an important product line for us and supplying items like wooden percussion mallets, wooden rolling pins, wooden dowel pins, wooden dowel rods and wooden massage rollers expanded our capabilities. As American Made Products expanded the market place for attractive Commercial and Retail goods, the need for increasingly attractive Components developed. In order to satisfy that demand, Wood Turnings became more attractive and defined. Wood Turnings such as wooden appliance handles, wooden spindles & finials, wooden craft parts, wooden table legs and wooden novelty turnings all contributed to the “Made In America” definition of quality. As the demand for affordable office space increased, our customers required an increased variety of Shaped Products and Components. Demand for retail and commercial working surfaces, shaped from high pressure laminated, office cubical dividers and advertising surfaces from faced interior plywood remain very popular. Baltic Birch table tops, furniture components and edged glue cutting boards are very popular. Again, our capabilities increased. Wooden Cases and Wooden Boxes have become very popular as retail and presentation choices. Wooden Jewelry Boxes have always been popular gift item and slide top wooden presentation cases are great for liquids and cosmetics. 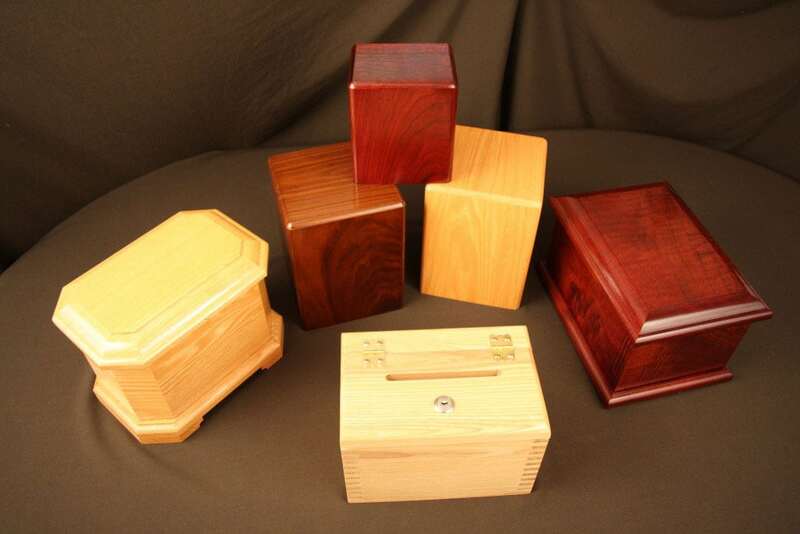 Wooden cremation urns are increasing in popularity as is the demand for wooden cases for scientific instruments. Performance Wood Products has continued to expand our capabilities to meet our customer requirements. How can we help you?